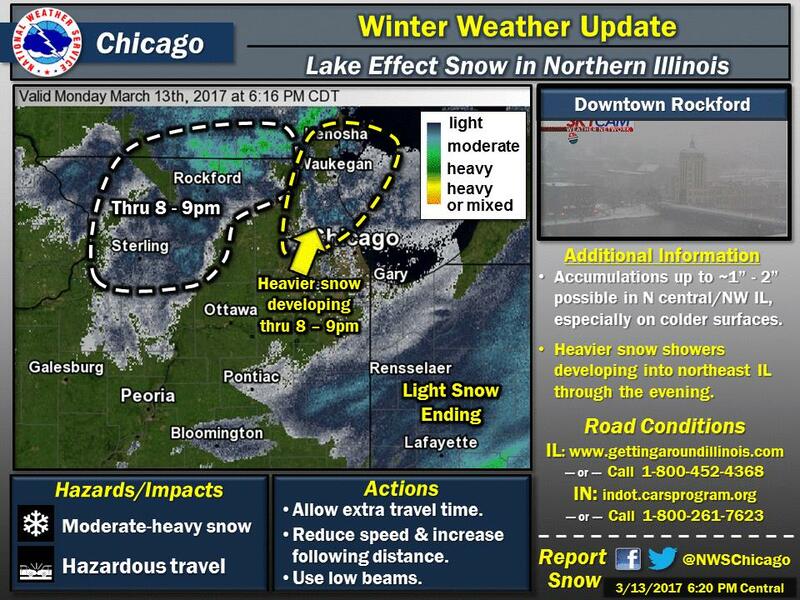 A Lake Effect Snow Warning has been issued for DuPage County. effective7:00 p.m., Monday, March 13, 2017, through 4:00 p.m. Tuesday, March 14, 2017. Because of the nature of lake effect snow bands, snowfall accumulations and conditions can vary drastically over relatively short distances. While not all areas in the warning will see significant lake effect snow, current indications continue to support some locations in the warning area experiencing 5 to 10 inches or more of snowfall from the lake effect tonight into Tuesday. Be prepared for snow covered roads and/or limited visibility and use caution while driving, especially during the morning rush hour.